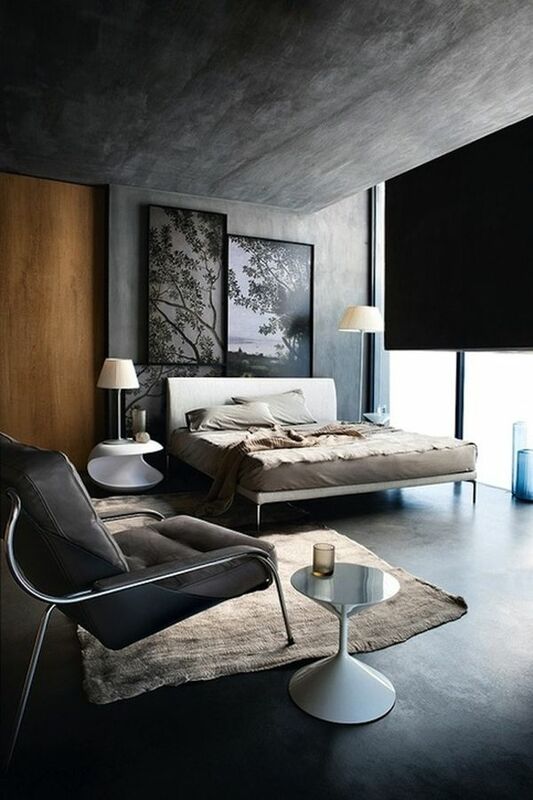 This modern bedroom designs in black and white are a real eye-catcher for all fans of this color palette. Decorating ideas in black and white have their own charm and delight their timeless elegance and timeless style. The room with a black and white decor can be both minimalist and very distinctive look – all depends on the details. Take a look at these 15 fabulous idea for a modern interior room in black and white. Usually, however, a balanced combination is preferred. 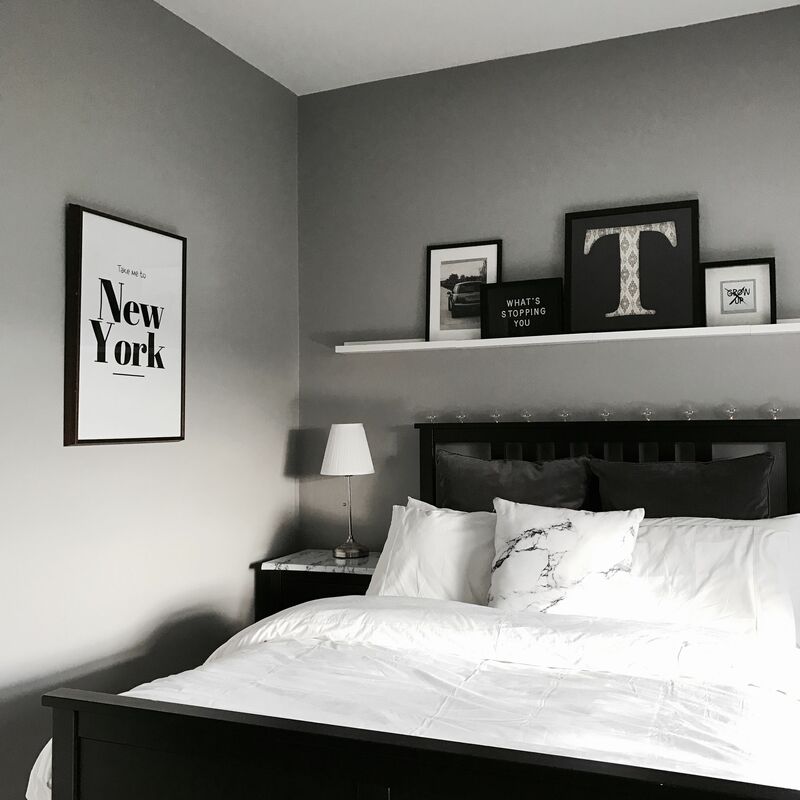 So a black headboard can rest against a white wall, a white bed sheet can be complemented by black accent pillows and a light gray rug can contrast with the dark-stained flooring. The most important thing is to find the right balance of black and white elements in the room. It should be cohesive look throughout so, if the walls are white for example, you can put in a black dresser, a matching bed and some small accent details featuring the same color. A really interesting approach is to opt for black flooring. This modern master bedroom has a shiny floor and accent pieces which combine the two colors specified above in a natural way. The area rug and the armchair share a similar theme. A bedroom can feature a really simple and basic color palette and still stand out, even if the décor is just as simple as the color scheme. Highlight the contrast between these two colors. Use white where you know it will be emphasized by the natural light and black where you wish to create focal points. Another possibility is to decorate with black walls. It’s enough to have one black wall white the rest stay white. Emphasize the strong contrast through framed wall décor. Put white features on the black wall and black features on the adjacent white wall. If a black wall seems a bit too dramatic for your style, opt for a dark gray shade instead. It will also pair nicely with other crisp white elements and you can coordinate it with a few other gray accent details such as a small area rug or a planter or vase. 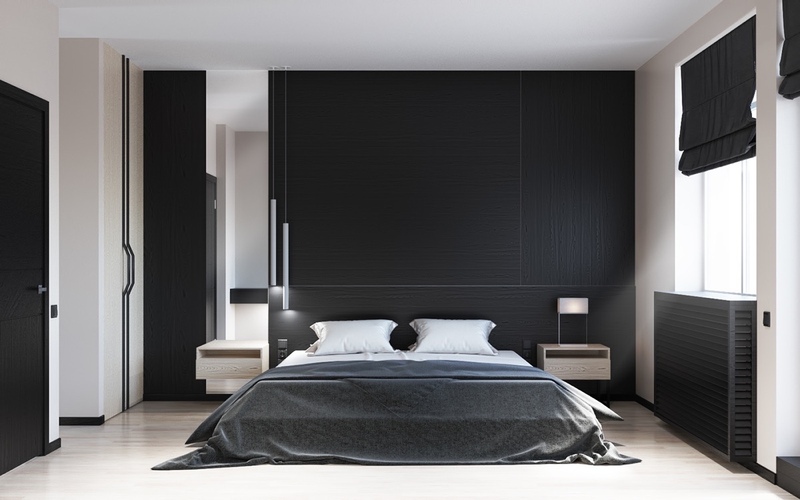 Give the bedroom a classic, elegant look using a black trim for white walls or bedding. Then you can also mix and match these two colors throughout the room. A black bookcase can be placed against a white wall, a black lamp on a white nightstand and so on. When the color palette is limited to only black and white, you can show your creativity by using various prints and patterns throughout the room. Opt for bedding that features graphic or geometric designs in these two colors. Even though the prints and patterns are very variate, the room décor stays simple and very enjoyable. We particularly like the way the black accent wall complements the bed and everything on it. 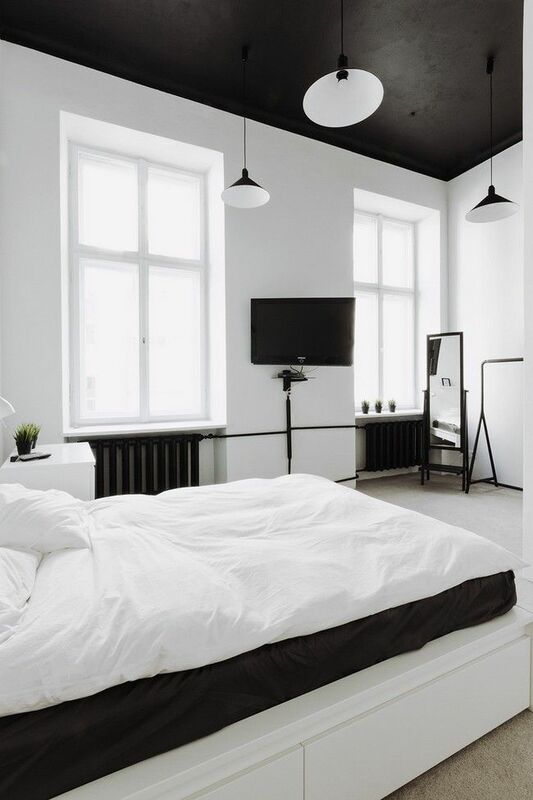 A huge black wall can darken the room, even if the rest of the walls are white. In this case, however, the slanted ceiling offers a perfect opportunity to include a black wall in the décor without making it stand out too much. It’s merely like a headboard which extends on either side to incorporate the nightstands. If the window wall is painted black, then the window will stand out and will seem a lot brighter because of the strong contrast. 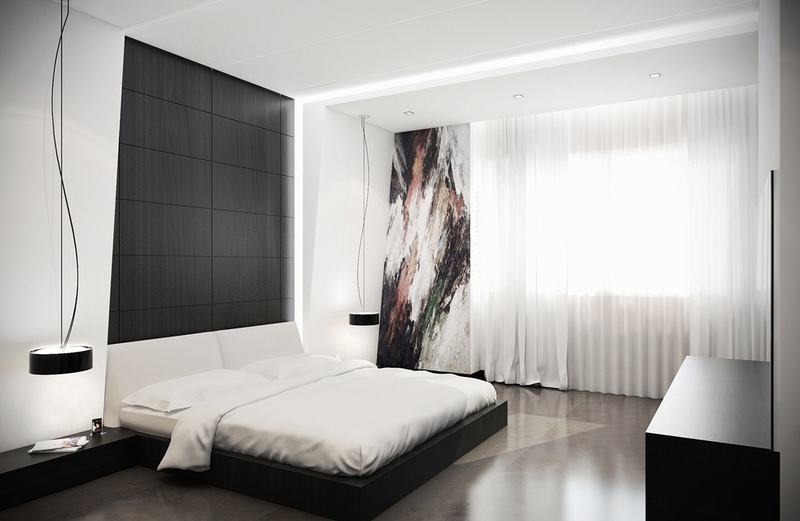 Continue the décor with a coordinating black floor which contrasts with a white platform bed. Soften the look with an upholstered headboard and an ornate chandelier.